You will have hours of enjoyment as you thumb through the pages and recall all the different pictures and stories that are represented in the book. A Lacrosse Book is a great way to encourage children in their sports as they will feel very proud to see their contribution to the team as a whole. Lacrosse Books make great presents for all of the Lacrosse members. 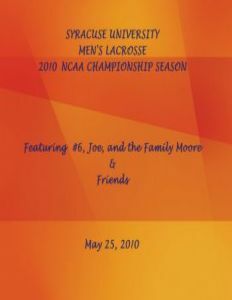 When your Lacrosse season is over, be sure to present the Lacrosse members with a beautifully bound book that will remind them of all their successes and the teamwork they share that mattered the most. Parents and children will always cherish their Lacrosse book and will be very proud of the work they did for their team, regardless of if their teams won or lost. Because our books are so well priced, purchase one for each person on the Lacrosse. You can also sell the books as a fundraisers for the team. If you want to reorder any of your Lacrosse books, we have a low minimum on reorders.